Objectives: Tinnitus is a commonly neglected otologic symptom among children in developing country. This study aimed at determining the prevalence, clinical characteristics, diagnosis and management of childhood tinnitus in a developing country. Method: This prospective hospital based study of patients’ age 18 years and below with complaints of tinnitus was conducted in Ear, Nose and Throat Department of Ekiti state UniversityTeaching Hospital,Ado Ekiti,Nigeria between April 2016 to March 2018. The parents/guardians/patients were briefed about the scope of the study. After getting oral consent, pretested interviewers assisted questionnaire was administered to collect data. Data obtained were collated and analyzed using SPSS software version 18.0 and was expressed in simple tables and charts. Results: Prevalence of tinnitus in this study was 6.2%. There were 56.1% males and male to female ratio was 1.5:1. Majority 55.3% had single episode of tinnitus and long duration (>3 months) was commonest form of tinnitus in 59.1%. Bilateral tinnitus was recorded in 68.9% while subjective tinnitus constituted 93.9%. Discrete tinnitus was commoner in 67.4%. Major causes of tinnitus were febrile illnesses, otitis media, noise exposure, unknown (idiopathic), earwax impaction and ototoxicity in 19.7%, 16.7%, 15.9%, 14.4%, 12.9% and 9.8% respectively. A commonest tympanometric finding was type A in 72.7% of patients. Commonly affected quality of life were anxiety, depression and attention problem in 51.5%, 43.2% and 40.2% respectively. Associated comorbid illnesses in this study were 50.8% sleeping disorders, 42.4% concentration disorders and 31.1% headache. Referrals were mainly from paediatrician in 44.7%. Prehospital treatment was mainly medication in 62.1%. All the patients were counselled (assured). Other treatments given were conservative treatment, surgery, ear syringing and hearing aids in 56.1%, 15.9%, 12.9% and 9.1% patients respectively. tinnitus, children, hearing impairment, ear symptoms. Tinnitus is said to occur when there is perception of abnormal sound in the absence of external stimuli around the patients. Patients may describe the sound as buzzing, ringing, roaring, clicking, pulsations, and other noises/ sound in the ear, or inside the head [1,2]. It is a common clinical complaint among children but often neglected or overlooked in children worldwide . Tinnitus in children was rarely spontaneous in nature and does not progress to adult tinnitus [4-6]. Generally, studies indicate tinnitus to be relatively common in childhood. Prevalence of tinnitus in children in previous studies varies from 7% in children age 5 to 17 years to 34% in children age 6 to 16 years in children with normal hearing [7,8]. Tinnitus has also been reported in up to 66% in further children with hearing loss . There were conflicting reports on prevalence of tinnitus in children. Some argued that the prevalence figures in children were underestimated owing to communication difficulties in children, while other argued that the tinnitus prevalence was over-reported in an effort to please the examiner . Tinnitus can be objective or subjective in nature. Objective tinnitus can be caused by sounds generated in the body that reaches the ear through conduction in body tissue . Subjective tinnitus is a phantom sensation, where abnormal neural activity is generated either in the ear, the auditory nerve, or the central nervous system . Subjective tinnitus and it can occur with hearing loss such as may occur after exposure to loud sounds, administration of drugs (ototoxicity). Tinnitus may also be due to a variety of pathologies such as illnesses, noise medications, ageing, allergies, dietary changes, stresses, or traumatic events. Tinnitus is often caused by pathologies related to the ear, head, and neck organ disorders like: head trauma or whiplash. Other most common causes of tinnitus is noise exposure. Noise of long or short term exposure can produce substantial and irreparable damage to the delicate inner ear outer hair cells. Tinnitus dramatically decreases the quality of life of the affected children which resulted in social isolation and when worst it gives rise to psychological disorders . Associated psychological factors include insomnia, anxiety, depression, worry, listening and attention problems . Psychological effect of tinnitus on group of children with normal hearing was more than those with impaired hearing . Common accompanying morbidities include sleeping and concentration disorders in learning abilities and school grades. Tinnitus also leads to headache, dizziness and vertigo . Majority of the affected children developed one or more coping strategies by suppressing the tinnitus by using external sound from small transistor, radio, television set and phone. They also distracted attention from tinnitus by playing with peers or reading. Tinnitus management in paediatric usually required multidisciplinary approaches . Tinnitus in children is often associated with hyperacusis and has also been associated with otitis media . Despite increase in number of children presenting with tinnitus worldwide there is paucity of literature on tinnitus in developing countries. This study aimed at determining the prevalence, clinical characteristics and diagnosis of tinnitus in a developing country. This was a prospective hospital based study of patients age 18 years and below with complaints of tinnitus. The study was conducted in ear, nose and throat department of Ekiti state university teaching hospital, Ado Ekiti, Nigeria. This study was conducted over a period of two years during the months of April 2016 to March 2018. The parents/guardians/patients were briefed about the scope of the study. After getting oral consent pretested interviewers assisted questionnaire was administered. Data obtained includes their biodata and age at first presentation. Other information collected includes duration, onset, nature, relieving and aggravating factors of the tinnitus. Past medical, surgical, drugs, hospitalisation, family and social history were also obtained. This was followed by otorhinolaryngological, head and neck examination while detailed ear examination with an Otoscope was performed. Aural and periaural auscultation was also done with stethoscope to exclude bruit. The hearing evaluations were done which included tympanometry and pure tone audiometry for frequencies ranging from 250 Hz to 8.0 kHz were indicated. The findings were documented. In this study, numbers and codes were assigned to each variable. Data entry was done in Excel spread sheet. Data was later transformed to SPSS (Statistical Package for Social Sciences) software version 18.0. Descriptive statistics was used to present the data. Data was analyzed and was expressed as simple tables and charts. For this study, ethical clearance was sought for and obtained from the ethical committee of the hospital. A total of 2,123 patients were seen in ear, nose and throat clinic during the study period, 132 children presented with tinnitus and were enrolled into the study. Their age ranged between 6-18 years with a mean of 14.2 ± 3.30 SD. Prevalence of tinnitus in this study was 6.2%. Tinnitus affected all the age group in this study. The peak age group was age 16-18 years in 67 (50.8%) of patients. Figure 1 showed the age group distribution of the patients. 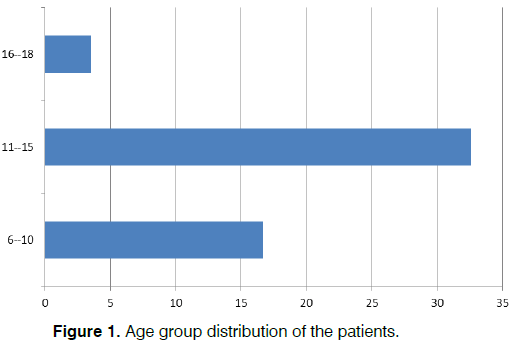 Figure 1: Age group distribution of the patients. There were 74 (56.1%) males and 58 (43.9%) females given a male to female ratio of 1.5:1. Christian faith 115 (87.1%), predominate over Muslim faith 17 (12.9%). Majority 71 (53.8%) were urban dwellers while minority 61 (46.2%) were rural dwellers. Based on parent education status, primary, post-secondary and secondary were 38 (28.8%), 34 (25.8%) and 31(23.5%) respectively. Majority of the studied parents were civil servant in 49 (37.1%), artisan in 32 (24.2%) and business in 23 (17.4%). See Table 1 on sociodemographic features. Table 1. Sociodemographic features of the patients (N=132). Minority 59 (44.7%) of the studied patients had recurrent/persistent tinnitus while 73 (55.3%) had single episode of tinnitus. Long duration (>3 months) was commonest form of tinnitus in 78 (59.1%) followed by 43 (32.6%) in 3 months duration. Bilateral tinnitus was commonest in 91 (68.9%) followed by right tinnitus in 27 (20.5%) and left tinnitus in 14 (10.6%). Subjective tinnitus constituted 124 (93.9%) while objective tinnitus constituted 8 (6.1%). Discrete tinnitus was commoner in 89 (67.4%) than multiple (musical) tinnitus in 43 (32.6%). Intermittent tinnitus in 86 (65.2%) was commoner than continuous tinnitus in 46 (34.8%). Non pulsatile tinnitus was commonest and accounted for 123 (93.2%) than pulsatile tinnitus in 9 (6.8%). Ringing tinnitus was commonest in 72 (54.5%) followed by clicking tinnitus in 37 (28.0%) and roaring tinnitus in 14 (10.6%). This is shown in Table 2. Table 2. Patterns of tinnitus among patients (N=132). In this study major causes of tinnitus were febrile illnesses, otitis media, noise exposure, unknown (idiopathic), earwax impaction and ototoxicity in 26 (19.7%), 22 (16.7%), 21 (15.9%), 19 (14.4%), 17 (12.9%) and 13 (9.8%) respectively. Less common causes were 6 (4.5%) ear trauma and 5 (3.8%) dental procedure. This is illustrated in Table 3. Table 3. Aetiology of tinnitus among patients. In this study, commonest typanometric findings was 96 (72.7%) type A followed by 28 (21.2%) type B and 8 (6.1%) type C. Pure tone audiometry findings revealed normal hearing in 38 (36.4%) while sensorineural hearing loss and conductive hearing loss accounted for 64 (48.5%) and 15 (11.4%) respectively. Further analysis revealed 32 (24.2%) mild hearing loss, 14 (10.6%) moderate hearing loss and 9 (6.8%) moderate severe hearing loss. Others were severe hearing loss in 7 (5.3%) and profound hearing loss in 2 (1.5%). Table 4 illustrated audiometric findings among patients. Table 4. Audiometric findings among tinnitus patients (N=132). In this study majority of the affected quality of life were anxiety, depression and attention problem in 68 (51.5%), 57 (43.2%) and 53 (40.2%) respectively. Others were 43 (32.6%) social isolation and 39 (29.5%) worry. This is illustrated in Figure 2. 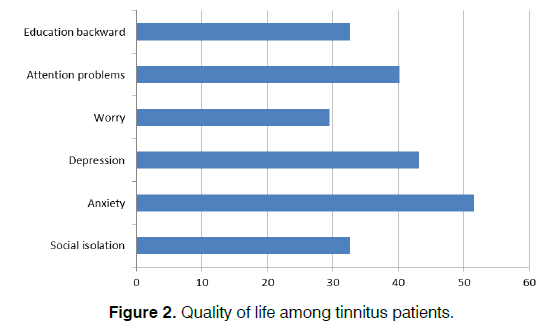 Figure 2: Quality of life among tinnitus patients. Comorbid illnesses recorded with tinnitus in this study were sleeping disorders in 67 (50.8%), concentration disorders in 56 (42.4%) and headache in 41 (31.1%). This is illustrated in Figure 3. 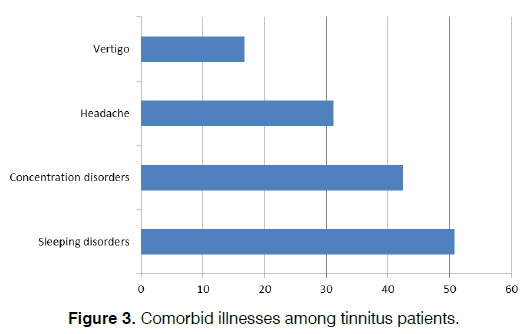 Figure 3: Comorbid illnesses among tinnitus patients. Referral were mainly from paediatrician, general practitioners and self-reports in 59 (44.7%), 46 (34.8%) and 23 (17.4%) respectively. Prehospital treatment were medication in 82 (62.1%), no treatment in 39 (29.5%) and hearing aids in 11 (8.3%). Levels of prehospital treatment dissatisfaction were no treatment in 89 (67.4%), medication in 18 (13.6%) and hearing aids in 9 (6.8%). Commonest treatment offered to patients was counselling (reassurance) in all the patients. Other treatment were conservative treatment, surgery, ear syringing and hearing aids in 74 (56.1%), 21 (15.9%), 17 (12.9%) and 12 (9.1%) respectively. See Table 5 for the illustration. Table 5. Pattern of management of tinnitus patients (N=132). Tinnitus in children is a common otological symptom with possible varying pattern of presentation in adult and children worldwide. This study revealed a prevalence of 6.2% in the studied paediatric patients. In this study, all paediatric age group with or without hearing impairment were studied. Different studies reported varied prevalence up to 70.0% within which the prevalence in this study falls [19-21]. The observed prevalence in those studies depended on associated otological diseases and patients age group. These otologic diseases may be associated with or without hearing impairment. In this study, increases in prevalence of observed tinnitus increase with patient’s age. Similar findings were reported by previous research work [22-25]. The reason may be that older children tend to identify tinnitus as an abnormal sensation. The younger children with tinnitus complaint were less than older ones. The younger children thought tinnitus experiences have always existed and normal. Other reason may be tinnitus in older children is more troublesome. There was male gender preponderance in this study which is similar to findings in other study with male gender preponderance . This is contrary to other studies with female preponderance [27,28]. These findings may be due to overactive male over female. Male are more troublesome and prone to infection, trauma and excessive noise. Majority of the studied patients were urban dwellers this may be due to barriers such as geographical location of the center in the state capital, financial constraints for transportation, hospital fee with medication also sociocultural background of the parents on available alternative medicine and poor understanding of tinnitus in children [29,30]. In this study there is no significant difference in parental education levels and parental occupation status. The aetiopathogenesis and management of tinnitus are poorly understood by the parents. Only very few patients were self-reports to the department for otorhinolaryngology intervention. Childhood tinnitus in this study was characterized by single episode, short term, bilateral, discrete, intermittent, subjective and non-pulsatile pattern to be the commonest. These features help in determining the nature of patient aetiopathogenesis, diagnosis and subsequent management. This finding is comparable to other study . The duration of symptoms at presentation was mainly after 3 months in majority of the patients. Like other disorder it was first diagnosed and treated for too long by local health care services provider with referred to a specialist as the last resort. Children may take tinnitus to be normal, ignore the sensation or parents do not the complaint seriously. This report is similar to finding in other studies [32,33]. In this study, the commonly implicated aetiologic factors of tinnitus in this study were febrile illnesses, noise exposure, otitis media, idiopathic, ototoxicity, and earwax impaction. These findings were also noted in reports from previous studies [28,33]. These factors are preventable with paediatric good health practices. It therefore means that parent should be health educated on common causes of tinnitus in children in our environment. In this study, minority of the patients had affectation of the middle ear cleft as demonstrated in the tympanometric findings. Few of the studied patients had normal hearing in our findings. Majority had associated sensorineural hearing impairment while few had conductive and mixed hearing impairment. Majority have bilateral severe to profound sensorineural hearing loss. It was also noted that majority of those with sensorineural hearing impairment were of mild type while minority were of severe and profound types. This contributed to low level of awareness and early presentation of tinnitus in our studied paediatric patients. These findings were reported in previous studies [26,28,33]. Most of the patients presented often too late with severe consequences such as reduction in quality of life. The affected quality of life in this study includes attention problem and social isolation. These were reported in other studies [28,34]. In this study, there was no associated mortality to tinnitus in our findings. Common associated comorbid illnesses in children with tinnitus in this study were sleeping disorders, concentration disorders and headache. This is caused by persistent noise in the ear or head. These were the common reason for presentation in our department for treatment. Majority of tinnitus patients wrongly presented other specialist. They are subsequently referred for otorhinolaryngology review and management. Only few patients were self-reports for treatment. Prior to otological presentation and due to poor understanding of treatment intervention majority seek over the counter drug. Few patients had no treatment with few patients on hearing aids. There were associated poor satisfactions to all preotological treatment such as over the counter medication and hearing aids. All patients had counseling alone or and other treatment. Childhood tinnitus is usually not distressing and some of the childhood tinnitus is selflimiting, counseling or reassuring is often beneficial as in other study . Treatment of underlying causes such as earwax impaction, otitis media and patulous eustachian tube were treatment. Conditions that were not amenable to treatment due to sensorineural hearing impairment were treated with hearing aids. All patients were followed up for three months, 101 (76.5%) satisfied with tinnitus treatment, 31 (23.5%) did not satisfied with tinnitus treatment and none reported worsen tinnitus. This finding is similar to reported findings in other study . In our study, childhood tinnitus is caused by preventable diseases leading to permanent otoneurological damage. At presentation, there were associated hearing impairment, comorbid illnesses and affectation of quality of life. Early diagnosis and management will prevent untoward effect. The authors are most grateful to Ekiti State University Teaching Hospital and all the patients who participated in this study. Shetye A, Kennedy V. Tinnitus in children: An uncommon symptom? Arch Dis Child. 2010;95:645-8. Schaette R, McAlpine D. Tinnitus with a normal audiogram: Physiological evidence for hidden hearing loss and computational model. J Neurosci. 2011;31:13452-7. Shargorodsky J, Curhan GC, Farwell WR. Prevalence and characteristics of tinnitus among US adults. Am J Med. 2010;123:711-8. Bulbul SF, Muluk NB, Cakir EP, Tufan E. Subjective tinnitus and hearing problems in adolescents. Int J Pediatr Otorhinolaryngol. 2009;73:1124-31. Nemholt SS, Schmidt JH, Wedderkopp N, Baguley DM. Prevalence of tinnitus and/or hyperacusis in children and adolescents: Study protocol for a systematic review. BMJ Open. 2015;5:e006649. Baguley D, McFerran D, Andersson G, McKenna L. Tinnitus, a multidisciplinary approach. Chichester, West Sussex, UK: John Wiley & Sons, Ltd., 2013;2. Jastreboff PJ, Jastreboff MM. Tinnitus retraining therapy: A different view on tinnitus. ORL J Otorhinolaryngol Relat Spec. 2006;68:23-30. Savastano M. Characteristics of tinnitus in childhood. Eur J Pediatr. 2007;166:797-801. Seydel C, Haupt H, Szczepek AJ, Klapp BF, Mazurek B. Long-term improvement in tinnitus after modified tinnitus retraining therapy enhanced by a variety of psychological approaches. Audiol Neurotol. 2010;15:69-80. Aazh H, Moore BCJ, Glasberg BR. Simplified form of tinnitus retraining therapy in adults: A retrospective study. BMC Ear Nose Throat Disord. 2008;8:7. Moller AR. Pathophysiology of tinnitus. Otolaryngologic Clinics of North America. W.B. Saunders, Amsterdam. 2003;249-66. Coelho CB, Sanchez TG, Tyler RS. Tinnitus in children and associated risk factors. Prog Brain Res. 2007;166:179-91. Kim YH, Jung HJ, Kang S. Tinnitus in children: Association with stress and trait anxiety. Laryngoscope. 2012;122:2279-84. Kentish RC, Crocker SR, McKenna L. Children's experience of tinnitus: A preliminary survey of children presenting to a psychology department. Br J Audiol. 2000;34:335-40. Baguley DM, Bartnik G, Kleinjung T, Savastano M, Hough EA. Troublesome tinnitus in childhood and adolescence: Data from expert centres. Int J Pediatr Otorhinolaryngol. 2013;77:248-51. Weisz N, Hartmann T, Dohrmann K, Schlee W, Norena A. High-frequency tinnitus without hearing loss does not mean absence of deafferentation. Hear Res. 2006;222:108-14. Kennedy V, Kentish RC, Stockdale D. Services for children with tinnitus. The UK experience. XI. International Tinnitus Seminar; Berlin, 2014. Rosing SN, Schmidt JH, Wedderkopp N, Baguley DM. Prevalence of tinnitus and hyperacusis in children and adolescents: A systematic review. BMJ Open. 2016;6:e010596. Tuz HH, Onder EM, Kisnisci RS. Prevalence of otologic complaints in patients with temporomandibular disorder. Am J Orthod Dentofacial Orthop. 2003;123:620-3. Baguley DM, McFerran DJ. Current perspectives on tinnitus. Arch Dis Child. 2002;86:141-3. Juul J, Barrenäs ML, Holgers KM. Tinnitus and hearing in 7-year-old children. Arch Dis Child. 2011;97:28-30. Gilles A, van Hal G, de Ridder D, Wouters K, Van de Heyning P. Epidemiology of noise-induced tinnitus and the attitudes and beliefs towards noise and hearing protection in adolescents. PLoS ONE. 2013;8:e70297. Holgers KM, Juul J. The suffering of tinnitus in childhood and adolescence. Int J Audiol. 2006;45:267-72. Park B, Choi HG, Lee HJ, An SY, Kim SW, Lee JS, et al. Analysis of the prevalence of and risk factors for tinnitus in a young population. Otol Neurotol. 2014;35:1218-22. Park KH, Lee SH, Koo JW, Park HY, Lee KY, Choi YS, et al. Prevalence and associated factors of tinnitus: data from the Korean National Health and Nutrition Examination Survey 2009–2011. J Epidemiol. 2014;24:417-26. Hall AJ, Humphriss R, Baguley DM, Parker M, Steer CD. Prevalence and risk factors for reduced sound tolerance (hyperacusis) in children. Int J Audiol. 2016;55(3):135-41. Mahboubi H, Oliaei S, Kiumehr S, Dwabe S, Djalilian HR. The Prevalence and characteristics of tinnitus in the youth population of the United States. Laryngoscope. 2013;123:2001-8. Bartnik G, Stępień A, Raj-Koziak D, Fabijańska A, Niedziałek I, Skarżyński H. Troublesome tinnitus in children: Epidemiology, audiological profile, and preliminary results of treatment. Int J Pediatr. 2012;945356. Adegbiji WA, Aremu SK, Lasisi AO. Patients barrier to ear, nose and throat surgical care in Nigeria. Am Sci Res J Eng Technol Sci. 2017;32(1):96-104. Adegbiji WA, Olajide GT, Aremu SK, Alabi SB. Barriers to adenoid and tonsil surgeries in Ekiti, Nigeria. Am J Med Sci. 2017;7(2):385-92. Adegbiji WA, Aremu SK. Epidemiological pattern of tinnitus in Ekiti. Int J Recent Sci Res. 2017;8(6):17816-20. Aksoy S, Akdogan Ö, Gedikli Y, Belgin E. The extent and levels of tinnitus in children of central Ankara. Int J Pediatr Otorhinolaryngol. 2007;71:263-8. Szibor A, Jutila T, Mäkitie A, Aarnisalo A. Clinical characteristics of troublesome pediatric tinnitus. Clin Med Insights: Ear Nose Throat. 2017;10:1-4. Brunnberg E, Lindén-Boström M, Berglund M. Tinnitus and hearing loss in 15-16-year-old students: Mental health symptoms, substance use, and exposure in school. Int J Audiol. 2008;47:688-94. Savastano M, Marioni G, de Filippis C. Tinnitus in children without hearing impairment. Int J Pediatr Otorhinolaryngol. 2009;73(1):S13-5. Bae SC, Park SN, Park JM, Yeo SW, Park SY. Childhood tinnitus: Clinical characteristics and treatment. Am J Otolaryngol-Head Neck Med Surg. 2014;35:207-10. Paper submitted to the ITJ-EM (Editorial Manager System) on May 01, 2018; and accepted on June 03, 2018. Citation: Adegbiji WA, Olajide GT, Olubi O, Aluko AAA, Olajuyin AO, Eletta PA, Yahya AI. Characteristics and Management of Childhood Tinnitus in a Developing Country. Int Tinnitus J. 2018;22(1):66-71.